This month's Fight Card release, The Adventures of Sailor Tom Sharkey (Mark Finn writing as Jack Tunney) is making its debut in time for the Robert E. Howard Days gathering in Cross Plains, TX. This is most appropriate as author Mark Finn is a recognized Howard scholar and Sailor Tom Sharkey is the spiritual cousin of Howard's character, Sailor Steve Costigan. The 'weird boxing' tales in the collection are complemented by a fantastic cover from Carl Yonder. 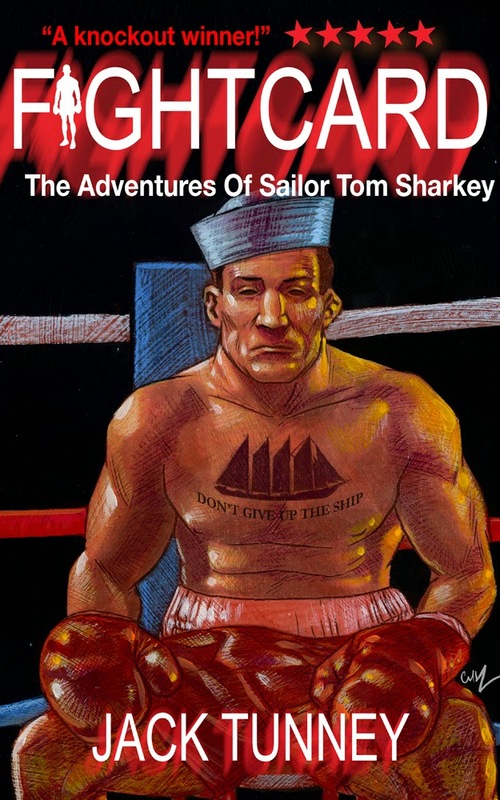 FIGHT CARD: THE ADVENTURES OF SAILOR TOM SHARKEY! The Best Weird, Historical, Humorous, Boxing Stories You'll Ever Read! Any mentions in your blogs or on your social networking sites are always appreciated. Coming up on the Fight Card schedule, we have Bridgeport Brawler from Dave White, Push from Nathan Walpow, Guns of November from Joseph Grant, Fight River from Tommy Hancock, Bareknuckle Barbarian from Teel James Glenn, Job Girl from Jason Chirevas, a second Sherlock Holmes tale from Andrew Salmon, and a currently untitled entry from Tim Tresslar.